Not to be confused with The Heist (2001 film), Heist (2015 film), or The Big Heist. 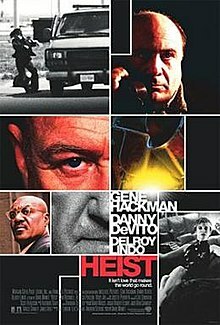 Heist is a 2001 crime thriller film, written and directed by David Mamet, which stars Gene Hackman, Danny DeVito, and Delroy Lindo, with Rebecca Pidgeon, Ricky Jay, and Sam Rockwell in supporting roles. Joe Moore (Gene Hackman) runs a ring of professional thieves, which includes Bobby Blane (Delroy Lindo), Don "Pinky" Pincus (Ricky Jay) and Joe's wife Fran (Rebecca Pidgeon). During a robbery of a New York City jewelry store, Joe's face is captured by a security camera after he takes off his mask in an attempt to distract the store's last remaining employee. As both the picture and a witness can identify him, Joe retires from crime and plans to disappear on his sail boat with his wife. This does not sit well with Joe's fence, Mickey Bergman (Danny DeVito), who runs a garment business as a front. After accruing a number of expenses in setting up another robbery, Bergman decides to withhold the payment due to Joe and his crew. He insists they go through with the other job — robbing an airplane carrying a large shipment of gold. Bergman further insists that his nephew, Jimmy Silk (Sam Rockwell), be a part of the crew. Joe accepts, but a series of shifting loyalties changes the complexity of their task, including Jimmy's interest in Joe's wife and Bergman and Jimmy's belief that Joe's skills are declining. They attempt to rob the plane twice. In their first attempt, while setting up explosive devices along the border of the airport, they are stopped by a passing officer. While Joe and Bobby talk the officer into leaving, an agitated Jimmy draws his gun but is stopped by Pinky. He forces his team out of finishing the job after he finds out that Pinky didn't destroy the getaway car, covered in the team's fingerprints. Bergman doesn't accept the team's departure and forces them to finish the job. The plane robbery is a series of misdirects. Pinky poses as a guard while Joe, Bobby, and Jimmy pose as airport security personnel. They stop the jet, pretending to be responding to an emergency. They fill a van with what they take from the plane, then move the van to a rented garage on the airport grounds, where they re-brand it and call for a tow truck to have it hauled away. Jimmy betrays the others to steal the gold and Fran. He knocks out Joe and tells Fran he knew Joe changed the plan, including Fran seducing him. He and Fran take the van, but Jimmy finds out that the hidden compartments are filled with metal washers. Joe avoids arrest and returns to the plane in disguise. He and Bobby remove a shipment of goods they had booked on board the same Swiss flight, which they insist now must be driven to its destination due to the plane's delay. Inside the shipment is the stolen gold, which Joe and Bobby melt into long rods. Bergman apprehends Pinky, who is walking his niece to the school bus. Pinky discloses the plan in order to save his niece, though he is killed after. Bergman and his crew arrive at Joe's sail boat along with Jimmy and Fran, where they hold Joe at gunpoint. They assume that the boat's golden railings are the gold. Fran leaves with Jimmy, pleading with Bergman to let Joe go. Just as Bergman discovers that the railings are not the gold, a hidden Bobby opens fire. Bergman's men are killed and Joe kills Bergman. Bobby gives Joe the address to send his share. Joe waits to meet Fran with a truck filled with black-painted rods. Fran has taken up with Jimmy for real and they take the truck from Joe at gunpoint. Joe gets into a second truck to leave. A black bar in the truck scrapes the garage door, revealing gold underneath. Joe lifts a tarp in the truck bed, revealing the gold rods. He covers the rods with the tarpaulin and drives away. According to Rotten Tomatoes, critical reaction for Heist was mixed, with an overall 65% approval rating. The website's critical consensus summary was that "Heist didn't cover any new ground, but the cast and Mamet's expertise with witty banter make it worthwhile." On Metacritic, the film received a weighted average score of 66/100 based on 33 reviews, indicating "generally favorable reviews." Roger Ebert for the Chicago Sun-Times, said "Heist is the kind of caper movie that was made before special effects replaced wit, construction and intelligence. This movie is made out of fresh ingredients, not cake mix. Despite the twists of its plot, it is about its characters." He went on to praise Mamet's trademark verbal constructions, his restrained approach to on-screen gunplay, and the care that he takes in shaping the relationships between the principals. In its opening weekend, the film opened at number 5, it grossed $7,823,521 in 1,891 theaters in the United States. The film became the highest-grossing David Mamet-directed film in the United States. In total it had a worldwide gross of $28,510,652, significantly lower than the film's production budget of $39 million. The film generated more than $72 million in home video rentals in the United States (significantly higher than the film's box office gross). ^ a b "Heist Movie Reviews". Rotten Tomatoes. Fandango Media. Retrieved 2011-04-18. ^ Ebert, Roger (November 9, 2001). "Heist". Chicago Sun-Times. rogerebert.com. Retrieved 2013-01-10. ^ "Heist". Box Office Mojo. Retrieved 2009-02-19.